Everyone in Granite Falls tells Carrie Randall the same thing. Is it a threat, or a warning? Yet even if it endangers her fresh start, Carrie needs to know what secret the town's hiding. There's her troubled student and his disturbing drawings. His fiercely protective father, and the mysterious death of his mother. And Carrie definitely has to find out more about the bad reputation of her standoffish new landlord, Logan Bradley. She wants to trust him, but she's been fooled by charm before. Is the town wrong about him—or is she? Tightening her grip on the steering wheel, Carrie Randall glanced again in her rearview mirror. The vehicle was still behind her. Billy? It couldn't be. She'd been so very, very careful. She'd caught a better glimpse of the car while negotiating a set of hairpin turns at a higher elevation. Not close enough to identify the make and model. But close enough to be fairly certain it was the same one that had tailed her for the past two hours. She palmed her cell phone, checking the number of reception bars on the screen. Zero. No surprise in this isolated part of the Montana Rockies, where bears probably outnumbered the two-footed residents three-to-one. She frowned at the odometer. Ten miles to the town of Granite Falls. The lane leading to her new home should be coming up in less than a mile. But if her ex-husband was following her, the last thing she wanted was to lead him right to her door. An earsplitting yowl erupted from the cage on the seat behind her, followed by the frantic scrabbling of paws. "It's okay, Harley. Just hang on." She stepped on the gas and rocketed past the little gravel lane that wound into the pines off to the left. Then she headed straight for town. 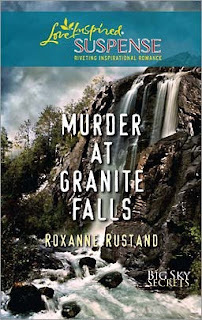 Granite Falls was as picturesque as its tourism website claimed. The mountain highway widened into a charming six-block-long main street flanked on both sides by historic storefronts, boardwalks and hitching rails straight out of an old Western movie. The center of town was filled with upscale shops and quaint restaurants geared to the tourist trade, while the dusty pickups nosed up to the feed store and cafe on the far edge of town revealed where the locals gathered. Would that be a safe place to stop? A maroon Lawler County sheriff's deputy patrol car parked face-out in front of the cafe made her decision easy. She checked in her rearview mirror once more, turned sharply into the parking lot and pulled up along the cruiser. Over her shoulder, she saw the dark sedan slow down, then speed past. Good riddance. If she lingered in town long enough, the driver might give up, or get careless and not see her leave. Though if it was Billy, he'd be back, restraining order or not. She turned to find a burly deputy behind her, a foam coffee cup in his hand, waiting to get into his car. The silver name badge pinned to his khaki uniform breast pocket identified him as Vance Munson. Perhaps in his late thirties, he'd probably been hot stuff in high school in an Elvis sort of way, until he'd put on some years and packed on an extra fifty pounds. With an affable smile on his face, a rumpled uniform and a cellophane bag of cookies in his hand, he reminded her of a genial teddy bear. "Sorry." She stepped back to give him space. "I…was a little distracted. I thought someone was following me on the highway." The deputy's full lips quirked into a smile. "You'll find a lot of tourists in these parts, headin' into town just like yourself. No cause for worry." "I'm actually moving here." She extended her arm, and he juggled his coffee cup into his other hand to accept the handshake. "Carrie Randall." He rocked back on his heels, taking her measure. "Welcome, then." "A dark sedan followed me for the past hundred miles then right into town." She looked up the empty Main Street. "Though I couldn't tell you the license plate or even the make of the car." "Like I said, you'll find a lot of travelers out here on long trips. Destinations are few and far between. People go sightseeing, and you might run into the same folks time and again. No call for worry." She eyed a family coming out of the cafe and lowered her voice. "I had to file a restraining order against my ex-husband last year." Munson's gaze sharpened. "Well, now," he drawled. "That might be a calf of a different color. He knows you're moving here?" "I certainly didn't tell him. I hear he's following a rodeo circuit down in the Southwest this summer. But…"
"But you aren't sure." Munson tipped his head toward the center of town. "Ma'am, you can find the county courthouse just four blocks west of here. You might want to file here, as well." "It's for your own good." He gave her a warm, encouraging smile. "Where are you staying? I can pass the word along. We like to keep an eye on things around here." Billy had dropped out of sight during the past year, while she stayed with her protective brother, Trace. During that time, she'd felt safe from Billy's volatile temper, which had escalated ever since their divorce. Now, she just wanted to start life fresh, with none of those old reminders. No looking over her shoulder. And no rumors filtering out about her being another one of those women who had fallen for charm and flash and ended up in an abusive relationship with an unfaithful man. In small towns like this one, idle talk by one of Lawler County's finest would reach the local grapevine and she'd be branded forever. "I—I'll be fine." A flicker of annoyance crossed Munson's expression. "Too many women fail to ask for help, ma'am, and the results can be mighty sad. Our sheriff's department will do whatever it can to assist you, but you have to cooperate." She sighed. "I have a summer lease on an upstairs apartment out at Wolf River Rafting Company." "The Bradleys," he said, his mouth twisting with a hint of distaste. He'd settled his aviator shades into place, but from his long silence and the muscle ticking along his jaw, she guessed that the deputy didn't approve. "Is there something I should know?" "Just.watch your step out there." He hesitated, as if he wanted to say more, but then he shook his head. "And don't ever forget to lock your doors." With Vance Munson's words still playing through her thoughts, Carrie felt a shiver of unease as she stepped out of her aging silver Tahoe and shielded her eyes against the setting sun. Sure enough, Wolf River Rafting Company was emblazoned in gilt letters on a sign over the door of the two-story log building overlooking the river and on the smaller, matching building next to the riverbank. This would be her home for the next three months, and she'd been lucky to find it through a chance discovery on the internet, though as she surveyed the area, a chill worked its way down her spine. The small clearing was bounded on one side by river, on the other three by impenetrable pine forest, and to the west the massive, snowcapped Rockies loomed high along the horizon. She should've expected a Montana Rockies rafting company would be located in an isolated place offering good access to a river, but she could see nothing else close by. Not a store, not a resort. Not even a cabin. And it was a good half mile off the highway, well out of sight of any passing traffic. Which meant she'd probably be totally alone come nightfall. Vulnerable. Was that why the deputy had seemed hesitant about her moving out here? The tense knot in her stomach started to relax. Maybe that was it—he hadn't been hinting at any concern about the Bradleys. He just thought this place would be terribly isolated for a woman living by herself. Though right now, cheerful pandemonium reigned. A jumble of dirt bikes had been ditched against the trees by a group of mud-streaked boys fishing along the shore. They were fairly bursting with energy, jostling each other and teasing, and then one fell in the water and the rest laughed uproariously when he emerged. Carrie smiled, remembering the exquisite patience and silence of fly-fishing with Trace. Any fish within a hundred yards of these kids had probably long since skedaddled. among them, redirecting wayward straps and snugging the vests into position. Occasionally, she darted into the log boathouse to fetch a different size. The scene brought back happy memories of the river guiding job Carrie had held through college. It all seemed so normal. So safe. The woman in charge studied her for a split second, then hiked her thumb toward the building. "Logan's inside," she shouted. Carrie nodded, hit the lock button on her key chain out of habit, and picked her way across the river rock. At the corner of the building she abruptly came face-to-chest with a man in a faded Denver Broncos T-shirt and khaki cargo shorts. He caught her upper arms with his strong hands, steadied her, then released his grip. "Kayak rental?" At his touch, an expected sense of awareness warmed her heart, and she quelled a sudden flash of panic. Her immediate instinct was to run. After a heartbeat, she managed a smile and looked up into the bluest eyes she'd ever seen this side of Paul Newman on the silver screen. Oh, my. "Sorry," she mumbled, catching her breath. "I—I'm Carrie Randall. I'm here about the apartment." His face registered a flash of surprise, and from his quick, searching look, she knew he was probably thinking she was some harebrained city gal, way out of her element. "Well, then," he drawled as he tipped his head toward an open staircase on the side of the building. "Let's do the tour. I'm Logan Bradley, by the way." as though he belonged on some back lot in Hollywood, not here in the middle of nowhere. She blinked and abruptly jerked her hand back. This instant, blinding reaction was exactly what had drawn her to Billy, and the emotional wreckage from their divorce was still too painful to bear. Though fortunately, her concerns about that dark sedan appeared to be unfounded. Deputy Munson had probably been right about it belonging to some vacationer following the same long, long highway on the way to Granite Falls. No one had been lying in wait when she left town. No one had followed her here. Thank You, Lord. Logan frowned at her. By now, he had to figure she was not only a city slicker, but a fruitcake to boot, if she could barely shake his hand. He was probably even having serious second thoughts about accepting his new lodger. If he changed his mind, the newest teacher in Granite Falls would be sleeping in her Tahoe during summer term, because there was literally nowhere else in the area that wasn't priced for the affluent tourist trade. Isolated or not, this was her one shot for a roof over her head this summer, and she had no other choice. "The apartment?" she prodded, pinning on her brightest smile. He seemed to shake off his thoughts, and with a long sigh he led the way up a rustic outside stairway to a balcony that ran the length of the building. Two doors, one at either end, stood open to the warm afternoon sun reflecting off the river. Between them, six double-hung windows were raised to catch the soft, pine-scented breeze. He tipped his head toward the woman now shepherding the flock of older women into the raft. "My sister, Penny, is the assistant manager here. She lives in town, but she's out here almost every day." He cracked a lopsided smile. "She came up and aired your place out this morning and checked for spiders and mice, just so you wouldn't have any surprises." Given the intent gleam in his eyes, she wondered if he was hoping she'd just head straight back to town. He couldn't know that a few little guests were the least of her worries. His thick, dark lashes—it was so unfair, when a guy was blessed with what she couldn't even manage with mascara—lowered as he gave her a narrowed look. "Harley?" At least it was true for small vermin. If her raggedy old tomcat could handle the two-legged kind, she'd feel a whole lot safer. Logan ushered her into the apartment and she caught her breath in delight as she stepped inside. The photos on the internet realty listing hadn't done justice to the feeling of being up in the treetops, with the pine paneled walls and abundance of sunshine pouring in the windows. A bright crazy quilt hung on the wall above a ruby plush sofa and two matching upholstered chairs perfect for curling up with a good book. The L-shaped kitchen offered ample counter space with gleaming stainless-steel appliances that looked almost new. A gold, ruby and forest-green area rug warmed the hardwood floors. "This is absolutely lovely. I wasn't expecting it to be so nice." had a little too much fun with this. You have it for the summer, then a group of skiers has reserved it for over the winter. After that, she plans to live here during the tourist season every summer." Again, that little frisson of worry started to tie Carrie's stomach into a knot. "So you don't live on the property, either?" "Penny stays with our great-aunt in town and I have an old cabin a quarter mile upriver. At least one of us is here from sunrise until dark…most days. Though I'm on the road at times, as well." "Sounds like a busy schedule." He lifted a shoulder. "Penny and I are just getting the raft business going again after a few…setbacks last year. Eventually, she'll manage it and I'll start adding an outfitting business for trips up into the mountains." She nodded, hiding her dismay at his words. She would be alone here. Though no one knew exactly where she'd moved, except for her brother and his fiancee, and she'd carefully kept his ranch as her cell phone and credit card billing address since she could pay her bills online. With that and no home ownership records to trace, it would be hard for Billy or anyone else from her past to find her. Surely everything would be fine. But still, as she followed Logan down the stairs to go after her luggage, she started to pray. It's on my Nook! I'm hoping to read this book as soon as I finish one by Sandra Robbins that I'm reading now.